Member Mike has another update for us. Below, after the wiring instructions, you will find detailed instructions for the 50 kohm modification which is needed to operate the Vega transmitter (initially built for microphones) correctly with guitars. Thanks, Mike! 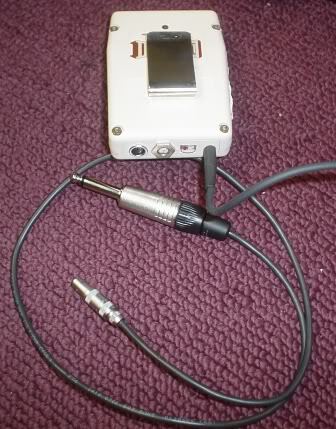 If you have the Vega transmitter that goes with your R42, you probably noticed that you can’t plug your guitar into it because it has a 4-pin LEMO connector and there is not enough room to add a 1/4 inch jack. Of course you could remove the connector and wire an instrument cable directly to the TX as Guido did with Fil’s unit but I liked the idea of being able to utilize the existing jack. I had some difficulty finding proper strain relief wiring a guitar cable direct. -thin 1/8 inch OD shielded cable such as Belden 8451-regular instrument cable is too large to accomodate the LEMO. This type of cable is commonly used in amps for master volumes. While you have the transmitter open, it would be a good time to add the impedance-changing resistor described below. 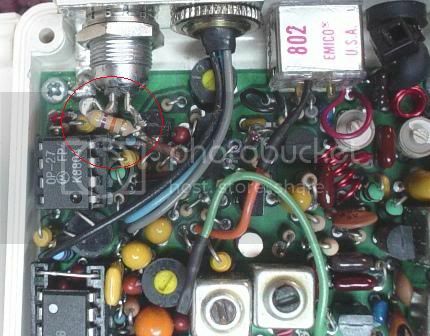 You will notice a yellow wire (ground) that is soldered to pin 4 of the LEMO jack. 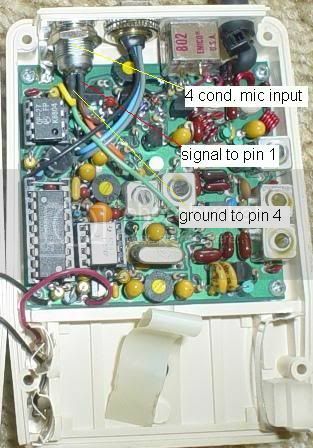 The brown wire is the signal wire and is on pin 1. The green and orange wires power the lavalier microphone and will not be used for guitar. You will need thin 2 conductor shielded cable to do this. On the LEMO end strip ¼ inch of insulation from the cable. Peel back the braided wire and foil and trim as short as possible and tuck any remaining braided ends and foil back into insulated jacket. The goal here is to make sure the outer shield does not touch the LEMO connector on the Vega end. This isolates the cable from excess noise. Slip the threaded nut of LEMO onto on to the cable, then the compression clamp, then the notched spacer. The LEMO clamp is too tight to use heat shrink here. Now solder black wire or ground wire to pin 4 of the LEMO and red or signal wire to pin 1. On the guitar or ¼ inch plug end strip cable and solder braided wire and black or ground wire to the plug shield together. Then solder the red or signal wire to the tip. The Vega transmitters (TX) that we have seen are matched for microphone input. Many of these units measure 10-20k ohm between signal and ground. In order to match the guitar input we need to raise the Vega’s resistance to 100k. We do this by installing a 91k resistor from signal to ground on the Vega TX. It would be a good idea to measure your own Vega TX to see what its resistance is. The idea here is to get to 100k. There are 2 ways to add the dropping resistor. 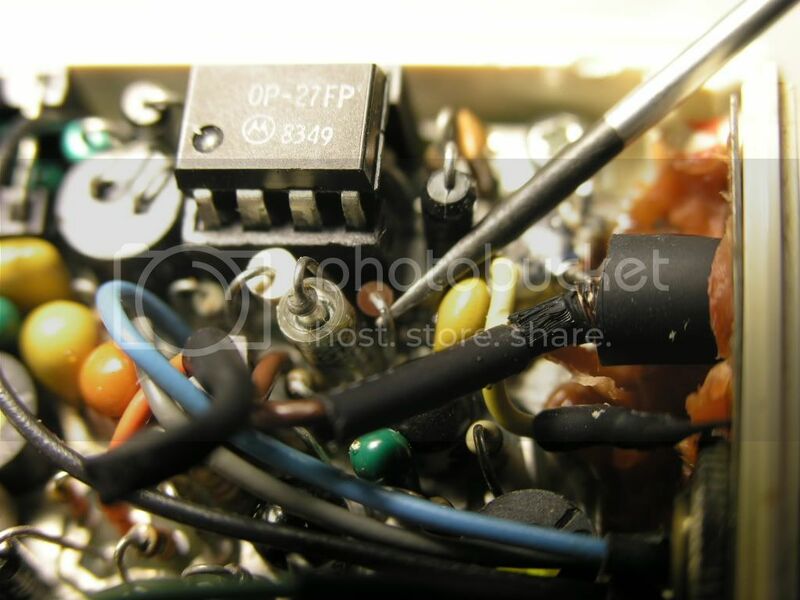 The easiest is to connect the resistor into the guitar plug in series with the signal wire and the plug tip or alternatively wire it internally on the Vega T.X LEMO jack. I chose to wire mine into the Vega thinking that would be best for noise suppression. Open up the Vega TX and you will see a brown wire (pin 1) and a yellow wire (pin 4) soldered to the LEMO jack. Remove shrink tube insulation and unsolder these 2 wires. Now take a 91k ¼ watt resistor and trim/bend the leads so one leg fits into LEMO pin 1 and the other leg into pin 4. Solder resistor into place. So I recently acquired an R42 unit and transmitter. I performed the modifications described here in these instructions but I have one question. When adding the resistor in parallel I measured the resistance across the pins and it was roughly the same. At first I was confused… but if the TX has a resistance of roughly 10K ohms and the the resistor is 91K ohms, in parallel that would be roughly 9K total resistance since it is in parallel and not series. SO SHOULD THE RESISTOR BE IN SERIES RATHER THAN PARALLEL???? So, if I have an R42 Cetec Vega, a Cetec Vega C-466A, and 4 T-77 transmitters, will the transmitter part of the guide work with a T-77? And will the conversion of the back boost work on a C-466A model? I think your t-77 should be the same as the photo tutorial. If I’m not mistaken, your transmitter is a T-77c. But this tutorial isn’t the right way to get the transmitter working. Well after lots of research and stuff, there are different kinds of T-77s, like specific T-77 models. Mine is the one that has a mini 2.5 audio jack rather than a LEMO. The C-466A is the housing, and the receivers are 66 models (but with Dynex III). Dries, how come this isn’t the right way? Changing input impedance of a device isn’t simply done by soldering a resistor parallel on the input wires. This only reduces the resistance… It must go up ! Input impedance of a device is the smallest resistance to the ground seen from the hot signal wire. In order to enlarge this, you must locate the input resistor. Late dynex transmitters have this resistor on the PCB board, but with some devices the input resistance is simply the resistance of the little trim pot, because it’s connected to the ground. The amount of signal then going into the opamp depends of what level the trim pot is on. Many transmitters have also an little elco in series with the input hot wire. This is done to filter DC from AC (audio signal) . You can check this to measure the resistance between the hot wire and ground. If this resistance changes constantly (goes up) , then there is one. I really need to start learning about electrical boards and soldering and stuff… A lot of this went over my head. If I’m reading this right: Basically sticking a resistor in the cable or in the TX where the input is only lowering it, not “changing” it? If I were to remove the resistor that is on the transmitter PCB, would using cables to change the impedance be more efficient? No you don’t really understand. You can put a resistor in series with the hot wire (in your cable or anywhere else), and this increases the indeed the input impedance. But… The signal going into the circuitry is also lowered. Because there flows a tiny current, and the resistor (see the transmitter also as a resistor for now) with the largest value, has the largest voltage over it ( so the greatest power dissipation) that means that if the input impedance of the TX is low, and you want to increase this by solder a resistor in series with the hot wire, the amount of signal going into the TX lowers. Not good! If you place a resistor in parallel, it only lowers the total resistance. Because the signal splits, there is again an less amount of signal going into the TX. Search the net for “Input Impedance of audio devices”. And read, probably a lot. Hey, how do you guys measure the output of your pickups? I have an ohmeter set to 20k and have just tried using a small patch cable to the input jack and just touching the probes on the other ends of the jack,making sure the volume & tone pots are fully up, is this the correct way? Well, no, you need to put the probes directly at the wires of the pickup. Otherwise you would measure the tone and volume pots together with the pickup. What Happens if you dont insert the new resistor? Nothing harmful, it will just sound different. And I think you can also modify a standard guitar cable and put the resistor in the bigger guitar jack end. Another great option for a hot vintage sound that matches very well with an SG is the Seymour Duncan Custom Shop Brobucker. It is a 10kohm hot vintage pick that to me produces a sound very similar to Angus’ in Black Ice. Very clean, defined with great note separation. Mids are big although scooped, top end has great bite and sizzle. And I´ve read bottom end is bigger than the SD AY which is probably a good thing if you are not playing a cranked 4×12 cabient all the time. There is a lot of raving about this pickup on the SD forum as well a tone descriptions and comparisons. Best. Another update from Mike: Now also with intructions for the 50 kohm modification which is needed for proper guitar operation. These instructions have been most helpful! I printed them out with pictures and my amp tech is modding my transmitters this week. I can’t wait to try them out! Mike, Franz, Fil, Guido, and others that have contributed… THANK YOU! Hey Franz, maybe you know. That’s a good question. Short answer: I would wait and collect money for the Black Vega. I have several pedals here because I tried exactly this: getting closer to Angus’ tone. Just this gives a “much closer to Angus” tone. Best combination so far was the Bluesbreaker together with the DynaComp (sort of “rebuilding” that boost/compressor combinatiuon in the Vega). That brought me “a bit closer” to the BiB tone. The problem with boosters seems that every booster boosts different frequencies, so every booster sounds different. As a result one have to try several boosters to get the correct tone. Which costs time and money. Actually, the Vegas I bought are smaller, battery driven devices and missing the booster in Fils larger one, so I’m also thinking about what such a booster you mentioned in your links above will do to the tone. But before spending more money, I will play with the boosters I already have here. So, if you are looking for a pedal that gets you close to Angus’ tone, keep your money and wait for the Black Vega. It will get you as close to Angus’ tone as possible, I believe. But if you just want to play around and make your own experiences, a powerful booster (+20 db) and a compressor together with a tube amp (only tube amps can be boosted) would be a good start. Thanks again for answer !! I think an AY signature will also improve the tone of your Epi. I believe a lot of Epi owners changed their pickups for a better tone. For the MG-430fx, I would go for a tube amp instead of this one. It’s better when you spend all the 6-700$ for a good amp. Will make you more happy than a transistor based amp. Could be that the magnets losts some of its energy, but I doubt that this would happen within a year. Yes Franz is right… no MG :-/. Save money ,for about $ 800-900 you might find a 2204 (50 watt) or 2203 (100 watt). I’m looking for 2203 as we speak..but a JMP not JCM. Ebay has a few. Also, it would be very interesting, how the modern Marshalls sound. I mean, how close to Angus’ tone one will come with the MHZ Haze and Vintage Modern models. I mean, we are all after the vintage gear, but what’s up with the new ones? The 1959 reissue seems to be a cool one. I’ve had my AY sig. pickup for almost 2 years. When I bought it it read about 9.7k. Now (reading as of today) it measures 9.6k. Maybe others have loss but I don’t have that here. Congratulations Franz! You have joined the exclusive Order of the Vega Brothers. Thanks, Mike However, the little R66 is a bit different to yours and Fils. Tone pot is inside the box and it’s missing the second boost. For now, I have a great tone, but not the tone I wanted. But maybe it needs more experimenting. The R66, smaller battery driven receiver and same transmitter as Fil has. However, the receiver needs 4 9V batteries, thats pretty much. Will shoot some photos now. Tone is similar to Fils first examples with the Vega, it’s a bit too bright, will buy a 47kohm resistor later today. But the tonal texture is there. For now, the basic tone is there, but it’s way too bright. I’m using the monitor output, need to get a XLR to 1/4″ adapter and a 50 kohm resistor for less treble. Sweet pics! About time those got there. Would love to hear some audio. P.S. Any “obvious” reason stand out as to why the second unit doesn’t work? Didn’t look at the second unit yet. Both rx and tx look fine, nothing broken at the outside, the receiver looks even better than the working one. Maybe just a broken solder point inside the transmitter or so. Will open it later. Actually I’m still fighting with the tone. It’s so bright that my ears are almost bleeding Now it hasn’t an external “Tone” control but some internal pots for adjustment with a screwdriver. Found “Audio Level”, “Squelch”, “Dist” so far, trying several settings with them. For now I get close to Fils YSMANL tone but was not able to match it. That’s awesome. I wonder why the guy thought it was broke?? Got any recorded sound tests yet?? Maybe the mic of the set is broken. I have 2 complete sets with mics and everything. Damn, I fear this one is just the wrong Vega. Updated now with improved intructions from Member Mike. Hi. I don’t have a Cetec-Vega, but was wondering, isn’t there a cable you could use that connects from the transmitter to the guitar? I’m sure this isn’t the right one, but something like this? It seems like nowadays there is a cable or connector for everything – lol. I was not able to find one with the LEMO connector that plugs into the Vega transmitter. So I bought the connector and made one. Oh I see. The Vega TX doesn’t have a standard connector. If I ever get one, your instructions are excellent. I think even a novice like me might be able to do it. Thanks for posting. Fil if I inderstand that correctly, the 50 kohm resistor could then just placed right at the input jack, from pin 1 to pin 4, right? Also Franz, it could be put right inside the cable jack, thus not modifying the transmitter. However, I suggest to put it inside the TX for zero hiss noise. Not correct. The resistor should go between your guitar signal output and the vega signal input. You could wire it in the 1/4 inch plug at the tip or at the LEMO jack inside Vega. Solder the resistor to pin 1, then solder brown wire to other end of resistor. I like the idea of putting in the cable-less invasive to the Vega. The wires are small inside and there is a chance of dislodging a solder connection unintentionally. :-/ Just solder a small 1/2 watt 47k resistor to tip of 1/4 inch jack and then solder signal wire to resistor. I should mention that ‘heat shrink tubing’ is great for keeping things insulated. PS I have not tried the ‘resistor-in-cable’. Mine is in the Vega tx. I don’t know if it would add noise as Fil says. ^^^^ This is wrong. Please disregard. I verified with Guido that the 50k resistor in fact goes parallel from signal to ground or between pins 1 and 4. Also, and I didn’t know this until today, a 10k resistor needs to be clipped on the transmitter board. PS the Vega is sounding amazing! Thanks for correcting. So what to to? Just cut one of the resistors wires off? Are you speaking of the 10k or installing the 47k? I removed what I had done before to LEMO jack. I then found the 10k in Guido’s photo and clipped it where his screwdrive is in the photo and just seperated them so they don’t touch. It’s tight in there so I removed my LEMO wires first. You might be able to temperarily desolder the ground tab from the board so you can move the front of the case a bit to get in and clip the 10k. Then I took a new 47k put one lead in pin 4 and the other in pin 1. Those resistor leads fit very nicely into the jack lugs. Then I soldered brown wire to resistor lead sticking out of pin 1 and yellow ground to resistor lead of pin 4. It’s not easy because there is not much room. PS I also discovered a quieter way to wire the LEMO plug so stay tuned. I intend to modify the tutorial when Fil has time to help me edit. I also have to proper wiring for the receiver patch cable that was wired for Fil by Guido. If you do the Guido/Fil 50k mod and wire the LEMO ‘quiet’ you will be rewarded in the end. Any more questions , let me know. If I can’t answer, Fil oe Guido will. Yes, I meant the 10k. Indeed, just cutting the wire was my idea too. I’m also able to modify your posting, feel free to mail me at banane@exception.at and tell me what you want to change and I will do it for you. great yes I will Thanks! Hi Mike. Would you share the proper wiring for the receiver patch cable? I wasn’t aware that anything need to be done to the receiver. I thought only the transmitter needed the LEMO connector, 47k resistor, and 10k clipped. I want to provide my amp tech/electronic guru with your instructions because they seem perfect. Lastly, does the xlr to 1/4 inch cable used that connects the r42 receiver to the amp need to be hi-z (XLR)? That’s the only cable I can find and it says “Microphone cable” on the package. It’s also a Hi-z XLR to 1/4 mono jack cable, like this one? You do not need to do anything internally to Vega receiver. You just need to make a patch cable. I am working on updating this post at this moment and should have it up soon. I used a standard female XLR with standard microphone cable. As far as the transmitter, you can also leave the 10k in tact and add a 39k resistor instead of the 47k. (This is something that developed after this blog was posted) It is a good idea to measure the resistance at the LEMO to see where it stands. You want to end up at 50k. I am referring to your link. This patch cable has a TRS connector and is not needed here and also they don’t include a wiring diagram. Your best bet is to make one or find an audio buddy to do it for you. Connect pin 2 of female xlr to tip of 1/4 inch mon plug. Connect pin 1 of xlr to sleeve of 1/4 inch. Omit pin 3 of xlr. Thanks again for your help Mike. I’ll let you know how everything turns out next week. Yes, very very explanatory, thanks also from me… can someone explain what are the white/red indicator on the left side and the middle metal/white plastic thing next to the limo plug? What are they used for? Battery strength indicator. Red means dead. Very cool, will need this. Thanks, Mike! Gosh how I love this place. Thank you, Mike! It is Rock Heaven Fil!! Well, speaking for me, the AY sig pickup comes much closer to his tone than the standard 490T pickup, in my SG standard, so I’m happy with it. Wich pickups du you use? And am I seeing this right and there are nylon saddles on the bridge in the photo? What is the exact difference between a ”normal” one and the modified? and would you prefer the modified Seymour Duncan to a Gibson Angus Young Sig. pickup? Because I am out and about to upgrade my SG with a new bridge pickup. Hm. I think you sold me on the Gibson AY. I tried it several times and I really liked it. Changed also to the Gibson AY sig pickup here. Love its tone.